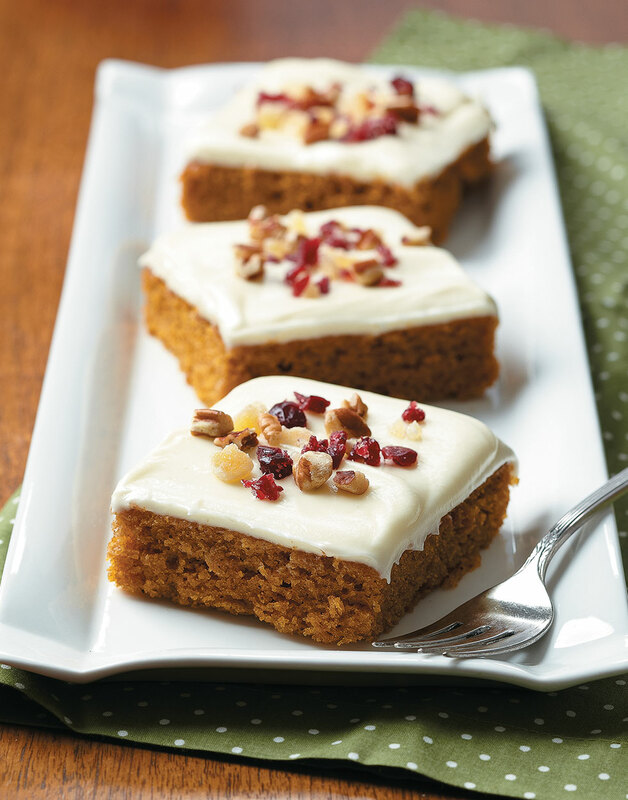 This pumpkin bar recipe is not only going to become a seasonal favorite, it’s one you’ll want to make year-round. And that won’t be a problem since this recipe uses pure canned pumpkin, which makes for a wonderfully moist bar. Cool the bars completely before covering them with the frosting so it doesn't melt off the sides. Whisk together granulated sugar, brown sugar, oil, pumpkin purée, eggs, and vanilla. Sift flour, baking powder, cinnamon, salt, baking soda, ground ginger, cloves, and nutmeg into pumpkin mixture; whisk until combined. Spread batter onto prepared baking sheet. Bake bars until a toothpick inserted in center comes out clean, about 20 minutes. Transfer pan to a rack and cool completely before frosting. Finely chop cranberries, crystallized ginger, and pecans; combine. Melt white chocolate in a microwave on high, 1–2 minutes; stir until smooth. Beat cream cheese and butter with a mixer on high speed until smooth. Add melted chocolate and beat to combine. Add powdered sugar and beat on low speed until smooth. Spread frosting over cooled bars. Cut into bars and top with cranberry mixture. Canned pumpkin actually has more flavor and is less watery than fresh. Add it to the other wet ingredients, then whisk to combine. Sifting flour before adding it to the batter adds air to the mixture, which makes for fluffier batter and lighter bars after baking. So the frosting doesn't end up lumpy, completely combine cream cheese and butter before adding melted white chocolate.